We’ve come to realise that water is a bigger feature of our trip than we’d expected. 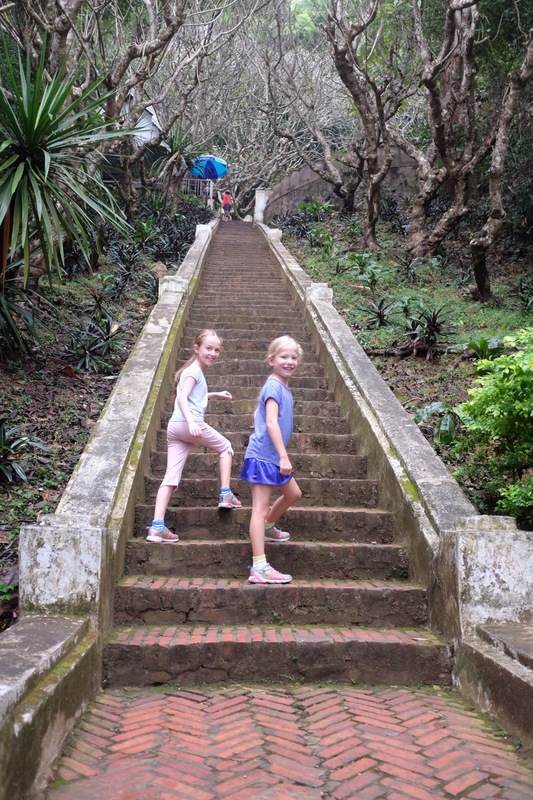 We stayed along the Kampot River with its soundscape and temperaments; then the Tonle Sap in Phnom Penh; the central lake in Hanoi; sailed through Halong Bay in the Gulf of Tonkin; all along experiencing the rain that, when it falls, feels like it will crush everything beneath it; and now the Mekong River in Luang Prabang. 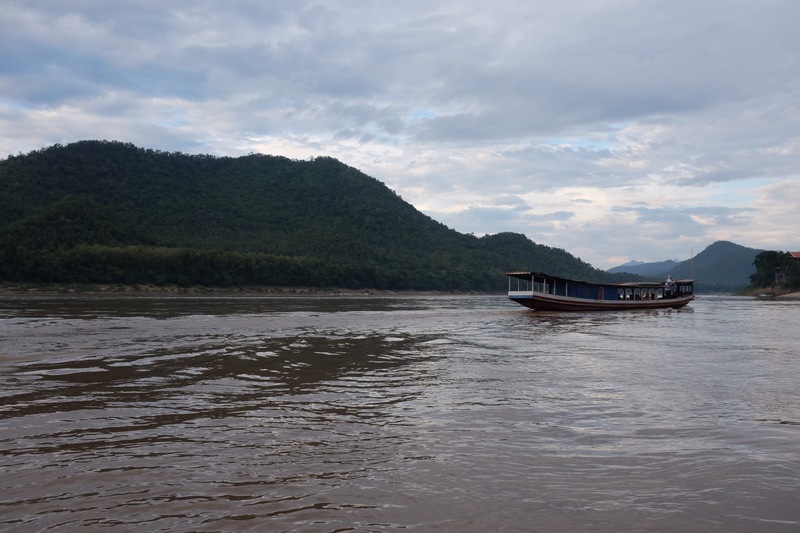 Staying this close to the Mekong feels like being with a celebrity. The Mekong influences all aspects of life in South East Asia- economic, cultural, political and has been in the media forever. It originates in the Tibetan Plateau in China and runs through Myanmar, Laos, Thailand, Cambodia and Vietnam. Here, the Mekong forms the northern boundary of Luang Prabang and the road running alongside it is replete with guest houses boasting “riverside view”. 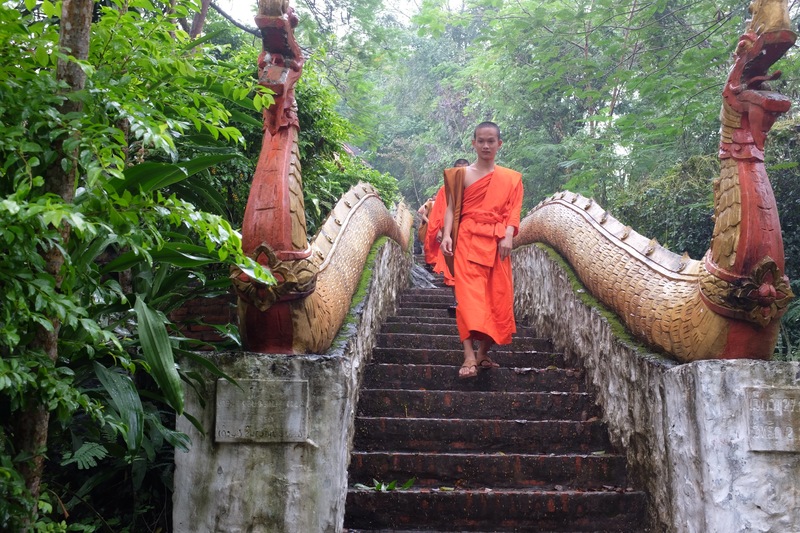 The Mekong makes a good landmark to orient oneself in Luang Prabang. It’s also great eyecandy for those of us that like to watch the river from the shore and see whatever takes place in and on it. 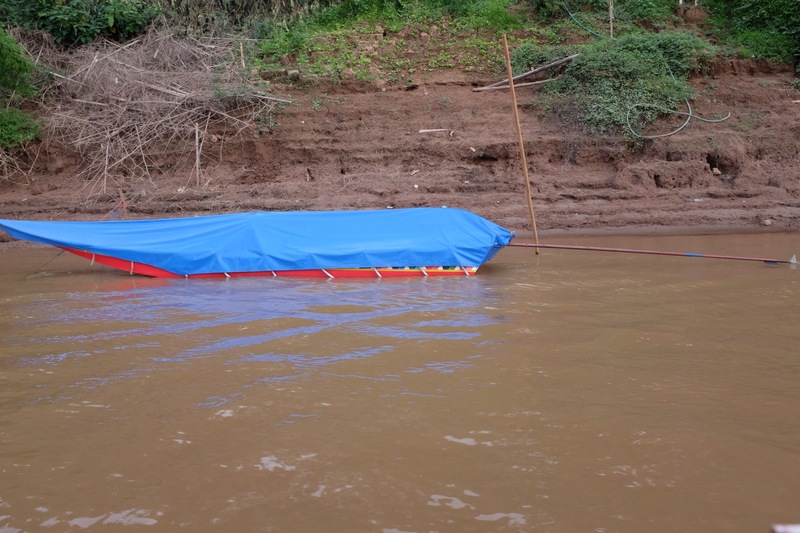 Yesterday we hired a boat-taxi to take us for a 90-minute ride on the river. As mentioned in the last post, the boats are 40 foot long and 5 foot wide. The captain sits up at the front controlling the boat with a steering wheel and a throttle that is simply a wire running the length of the boat, connected to the motor. Not easy to steer but our captain controlled his ship effortlessly. Our captain also provided excellent commentary during the journey. We saw many fishing nets. When we asked what the fisherfolk catch, we learned: “big fish, small fish, no shark, no crocodile”. 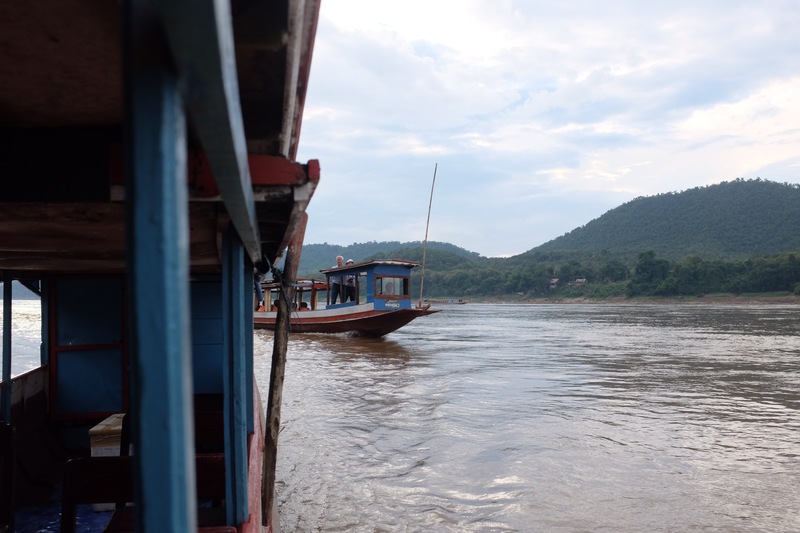 The Mekong has a ton of traffic on it. These large cargo ships can move 200 tons of goods. They run mostly between Laos and China. 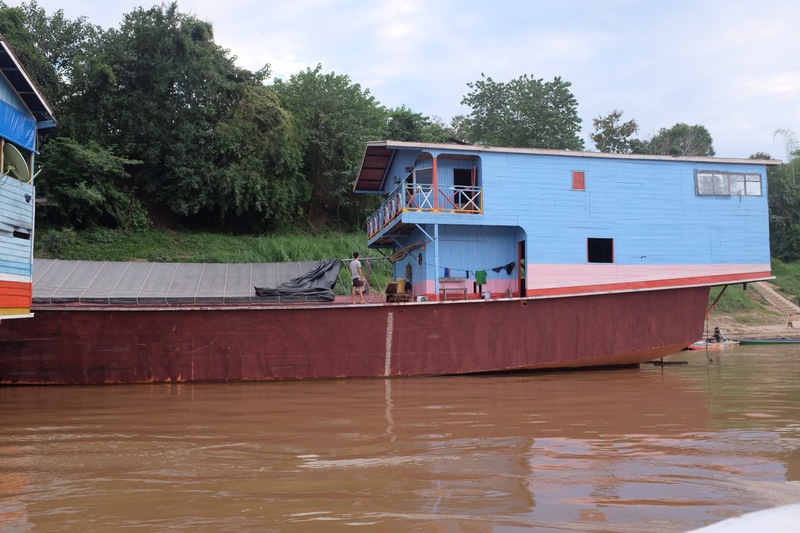 Apparently there are no big storms on the Mekong, all the better because the “house” part of the cargo ship looks like it would get ripped away by a stong gust. The trip takes two days and passengers are put up in guest houses along the way. For those in more of a rush, however, this boat will take you to the border in eight hours. Interestingly, the river has also provided something of a social pressure relief valve for Laotians. The Pathet Lao took control of the country in 1975 and has ruled the country through the Lao People’s Revolutionary Party (LPRP) ever since. Laos is thus a single party socialist republic and the only legal party is the LPRP. One of the explanations for the relative lack of civil unrest during the LPRP rule is that people can simply cross the Mekong into Thailand if they get fed up with Laos. Culturally the two countries are very close. 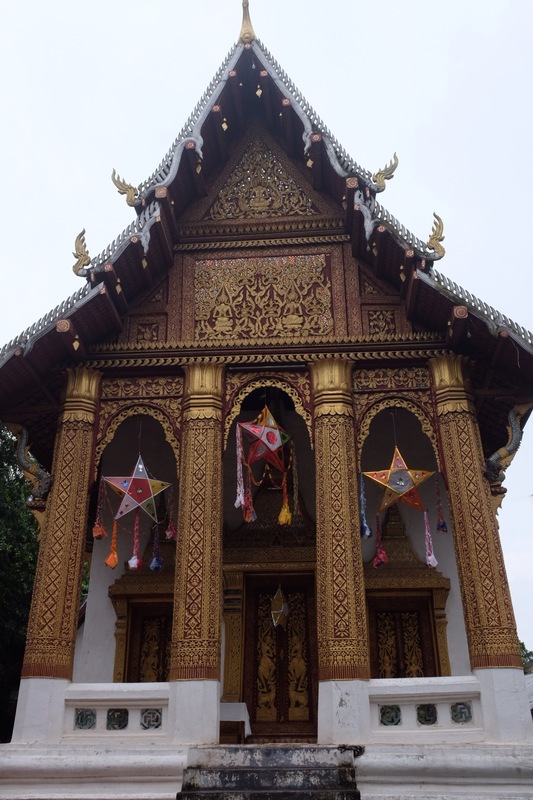 Linguistically, someone speaking Thai can make herself understood in Laos and vice versa. At the moment, it’s the dry season and the water level is low. We were struck by the number of gardens that are planted on land that’s reclaimed during the dry season. People grow all sorts of fruits and vegetables on land that is otherwise submerged during the rainier months. Getting to Chomsi was a nice climb. 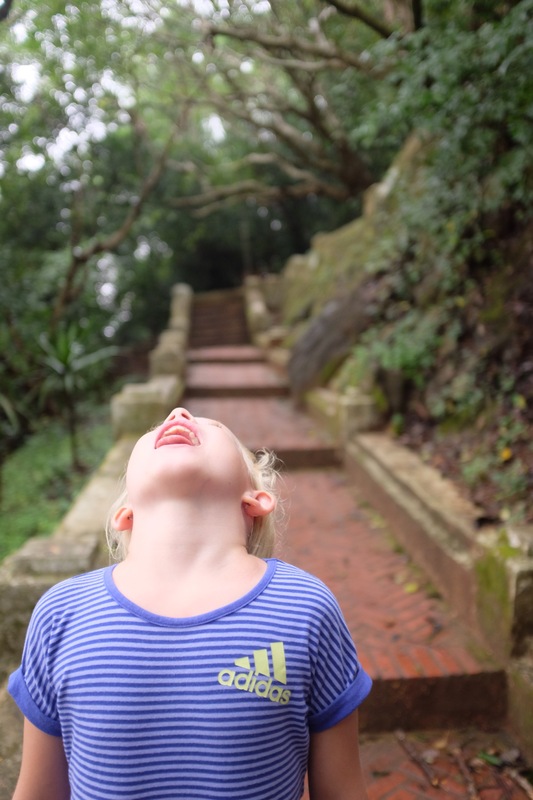 There are lots of steps (more than 350!) and partway up it started to rain (Ida caught some raindrops). 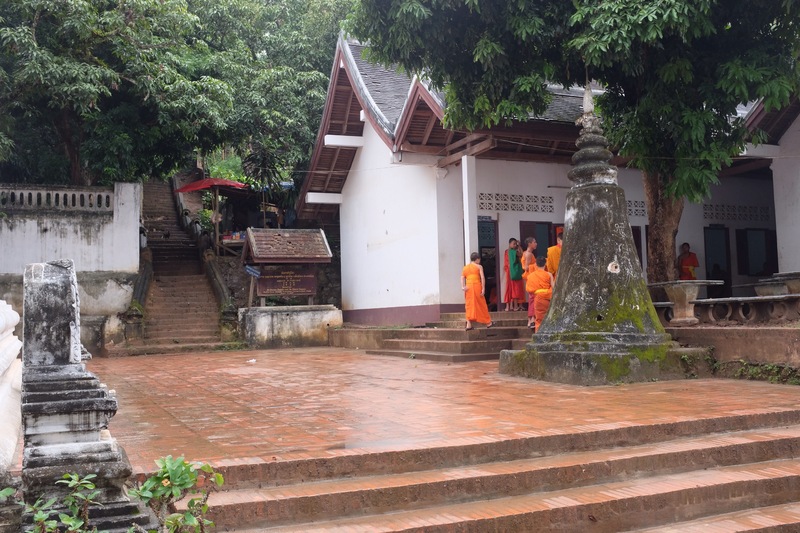 Luang Prabang has about 36 pagodas and is not a very big town. A lot of pagodas and a lot of monks. These monks were on their way to school, next to another golden pagoda. That pagoda was tucked away around the corner from a stretch of the main street that we have walked by countless times, never realising that such a beautiful building was hidden away. Wonderful pictures — bringing back some great memories for me, too. To this day, my favourite voyage I have ever undertaken was a Mekong voyage: 7am departure from Sisowath Quay in Phnom Penh on a boat for hire. 12 hours later: arrival at the foot of Dong Khoi St. in Ho Chi Minh City. In between: the most fantastic scenery you could ever imagine. 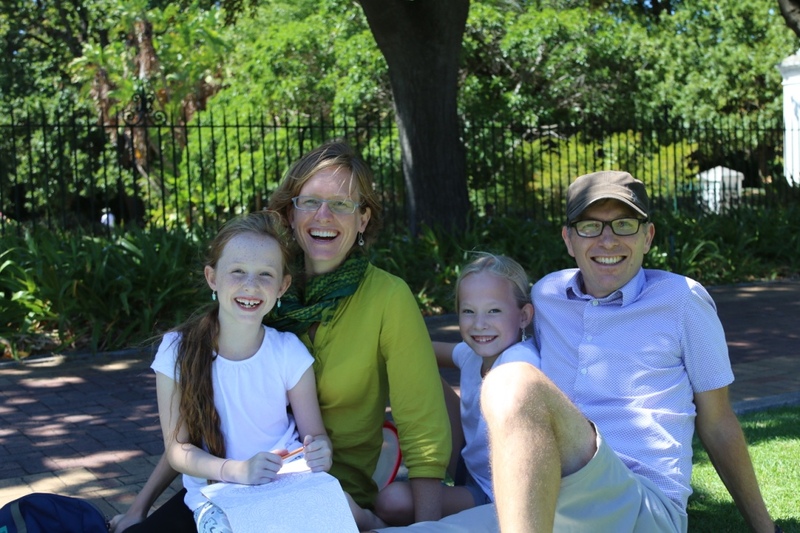 Not necessarily a trip to do with kids (it was a fast boat!) but one to contemplate for your next visit to this mighty river. Keep writing these great updates! Already eagerly awaiting Botswana. Fantastic and wonderful, what scenery and description. Wow Nigel. An amazing journey. Great photo’s. Thank you for sharing. Looking forward to more. Be safe. 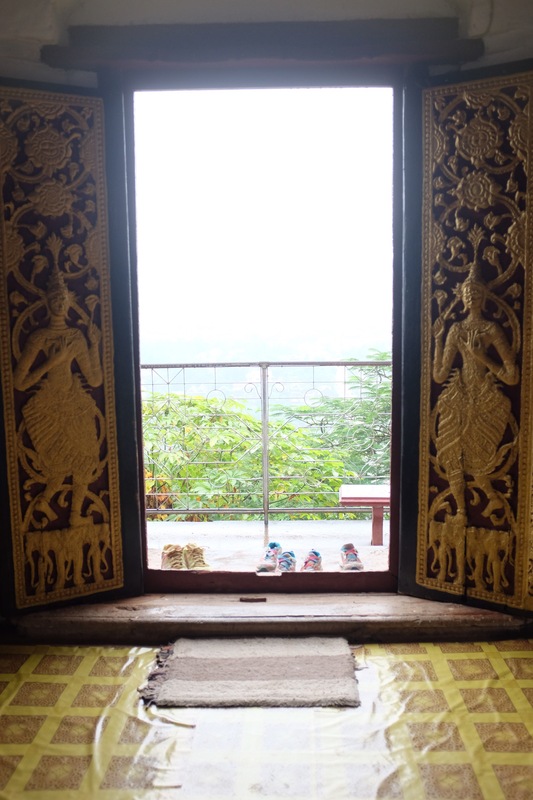 I have fallen a bit behind on joining the blog posts but I wanted to tell you how much we enjoyed this post on Laos. The photos are gorgeous and your thoughts on water are fascinating. We just love sharing your experiences and perspectives. Thank you.